Gamma Girl Slots | Get a HUGE BONUS + 60 FREE SPINS! 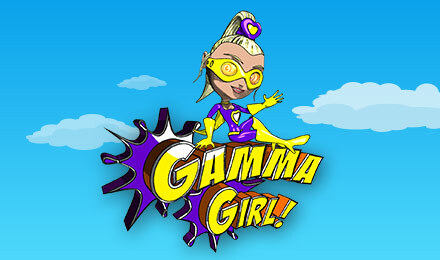 Power through the superhero themed Gamma Girl slot adventure to scoop superhero prizes! Soar past Gamma Girl Wilds, Fire Scatters, extra FREE Spins, 3 bonus rounds, multipliers to hunt down legendary jackpot rewards! Grab your superhero cape, and prepare to soar through the intergalactic Gamma Girl Slots adventure! This superhero game is pulsating with five reels and 25 pay lines of cute girl power icons and plenty of bonus and jackpot action! One of the super cool highlights is that you can line up the word K-A-P-O-W across the reels to score a super hero Word Combo bonus! The Gamma girl icon is the hero wild for the game, and if you score a winning combination of Fire scatters, you can unlock the Rescue Bonus round. This ‘Pick Me’ style game offers the chance to multiply your bets by up to 100! If you score 3 or more Gamma symbols, this triggers the Gamma Girl Match and Win round where you can match pairs of symbols and scoop more superhero jackpot rewards!